Order Quiznos catering for breakfast, lunch, dinner and anything in-between. At Quiznos we make toasty, delicious sub sandwiches to satisfy any taste. Striving to make the best subs, we only use high quality ingredients. Let us cater your next event in Calgary. 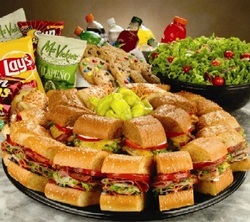 Quiznos is perfect for business meetings and lunches, birthday parties, school events, entertaining guests at home, or any kind of get together! We are known for our high quality meats, chef-designed recipes, great food, reliable service, and prompt delivery. We can cater for up to 500 ppl with only a few days notice! © 2018 Calgary Quiznos, Shawnessy. All Rights Reserved.